Even if new molecules are discovered to treat severe diseases, the clinical use and efficacy of conventional chemotherapeutics is hampered by the following limitations : (i) drug resistance at the tissue level due to physiological barriers (non cellular based mechanisms), (ii) drug resistance at the cellular level (cellular mechanisms), and (iii) non specific distribution, biotransformation and rapid clearance of the drugs in the body. It is therefore of importance to develop nanodevices able to overcome drug resistance in various pathologies resistant to chemotherapies, incl. cancer and infectious diseases. This is illustrated by the camouflage of doxorubicin into biodegradable polyalkylcyanoacrylate nanoparticles (PACA), allowing to overflow the PgP detoxification capacity, thus inducing reversion of the multidrug resistance (MDR). The higher cytotoxicity of doxorubicin when loaded onto poly(isohexylcyanoacrylate) nanoparticles has been shown on the X/myc transgenic mouse model of hepatocellular carcinoma which mimics several steps of human hepatocarcinogenesis (1). Based on these data, a phase III multicentric clinical trial is currently performed on patients with resistant hepatocarcinoma or liver metastasis. Recently, advanced multifunctional PACA nanoparticles have been constructed which combine : (i) a biodegradable nanoparticle core for drug entrapment, (ii) equipped with single (2) or multiple (3) fluorescent tag for imaging, (iii) coated with a polyethyleneglycol shield and (iv) functionalized with specific ligands for drug targeting (4). 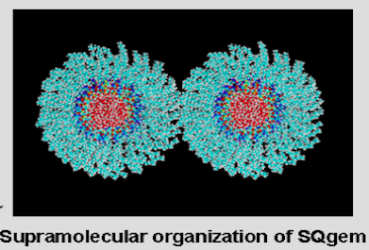 Another illustration of this approach is the “squalenoylation” (5, 16), a technology that takes advantage of squalene’s dynamically folded conformation to link this natural and biocompatible lipid to anticancer and antiviral nucleoside analogues in order to achieve the spontaneous formation of nanoassemblies (100–300 nm) in water without the aid of surfactants (6). When applied to the anti-cancer compound gemcitabine (7), this original concept was demonstrated to be able to overcome different mechanisms of resistance to gemcitabine (8), ie. deamination of gemcitabine by the blood deaminases, down regulation of nucleoside transporters and/or insufficient phosphorylation by the deoxycytidinekinases (dCK). Indeed, the squalenoylated gemcitabine nanoparticles were found (i) to be resistant to deaminases, (ii) to diffuse intracellularly independently of the presence of nucleoside transporters (9) and (iii) to improve the phosphorylation of gemcitabin by dCK. This breakthrough concept has been further enlarged to other anticancer drugs, including paclitaxel and doxorubicin (10, 17), cisplatin and small interfering RNA for the inhibition of the ret/PTC fusion oncogene in the papillary thyroid carcinoma (11), as well as to the treatment of resistant intracellular infections by the development of stimuli-responsive nanodevices (12, 18). The entrapment of ultrasmall iron oxide nanoparticles in those squalene-based nanoassemblies has further allowed to design multifunctional nanoparticles combining therapeutic and imaging properties (ie. the so-called “nanotheragnostics”) (13). This new concept open the way to the personalized medicine. Finally, the use of nanohybrids (14) constructed with metal organic frameworks (nanoMOFs) will be reviewed for their ability to encapsulate unprecedent high quantities of the anticancer compound busulfan also allowing imaging of tissues and organs in vivo (15).